But it didn’t. It was much more, erm, fun! Breakfast came and went, as expected. The first variation from the plan came in the form of an extra passenger – our guide, Željko. He needed to get to Dubrovnik to guide another tour group; his only option to get there on time was to catch a bus at 2am. When we heard about that, we suggested that perhaps he might like to come with us, leaving at about 8am. Unsurprisingly, he agreed. On our taxi ride to the airport, his phone rang, and one didn’t need to understand Croatian to realise that he was receiving bad news. 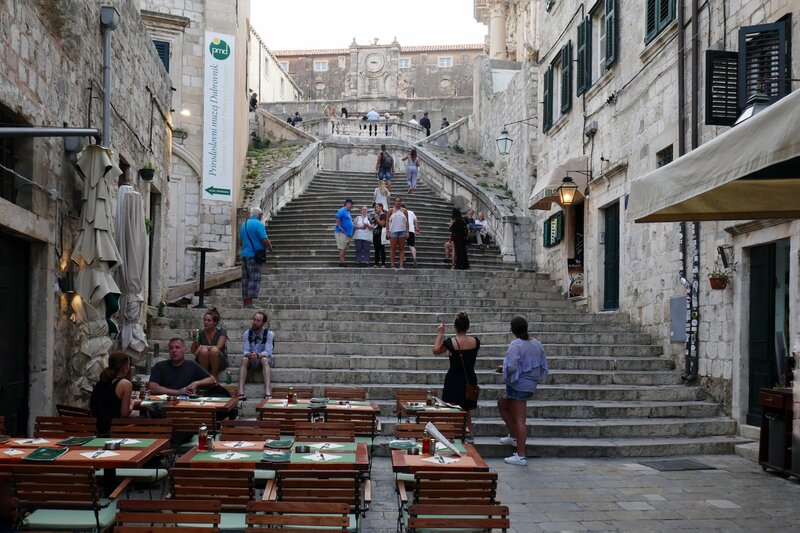 It transpired that he had left vital paperwork back at the hotel – tour notes, vouchers, all the vital stuff that he needed in Dubrovnik for his next group! Fortunately, there was enough slack in our schedule to allow us to take him back to the hotel and then on to Dubrovnik. So, papers collected, we headed back to the motorway and started the four-hour drive southwards. I was a little concerned about the border crossings we’d need to do through Bosnia, and so my idea had been to ensure we got back into Croatia on schedule before thinking about maybe a rest stop. However, Željko had other ideas, and suggested that we stop for lunch – in Bosnia! As usual, he had a good suggestion, and so we found ourselves at the Hotel Orka, eating a traditional “Bosnian Pot” – beautifully tender beef chunks and vegetables in a very tasty sauce. As well as the beef, I swallowed my principles and took a photo of my lunch. But I’m not about to go as far as sharing it with you! After lunch, we set off with (we fondly imagined) enough time to get us to our destination on schedule. We had reckoned without a few factors, though: hitting the border back into Croatia just at shift change time and so sat in a queue to get through for what seemed like an age, but probably wasn’t; being stuck behind camper vans; being stuck behind people on a slow moped. So we arrived at the Sixt car hire return at Dubrovnik airport somewhat late. However, Jane had managed to alert our new tour guide and so the taxi was waiting for us to take us onwards. “Onwards” was, we found, subject to the vagaries of the weather. Apparently, a strong north wind was in prospect and so our cruise boat – a Turkish gulet – had to plan to leave early to avoid getting trapped in Slano harbour. So, our group were actually on the tour of Dubrovnik that had originally been planned for tomorrow. Amazingly, in the melée that is downtown Dubrovnik on a Saturday afternoon, we found our guide, Filip, and joined him, after he’d given the taxi driver instructions about where to leave our luggage. 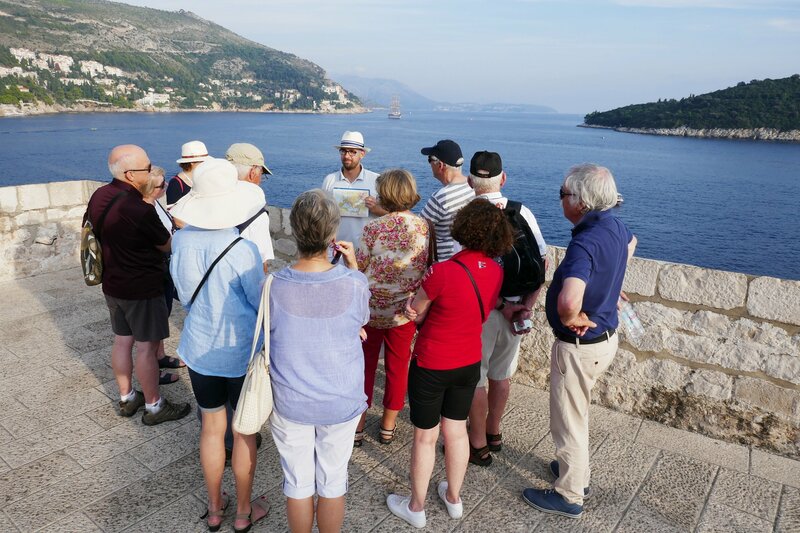 Filip, in turn, found the rest of our group and we continued with the tour of Dubrovnik old town, with Filip helping the official guide, a lass called Ana, by giving our group lots of historical, geographical and archeological information as we went along. Memory plays strange tricks. 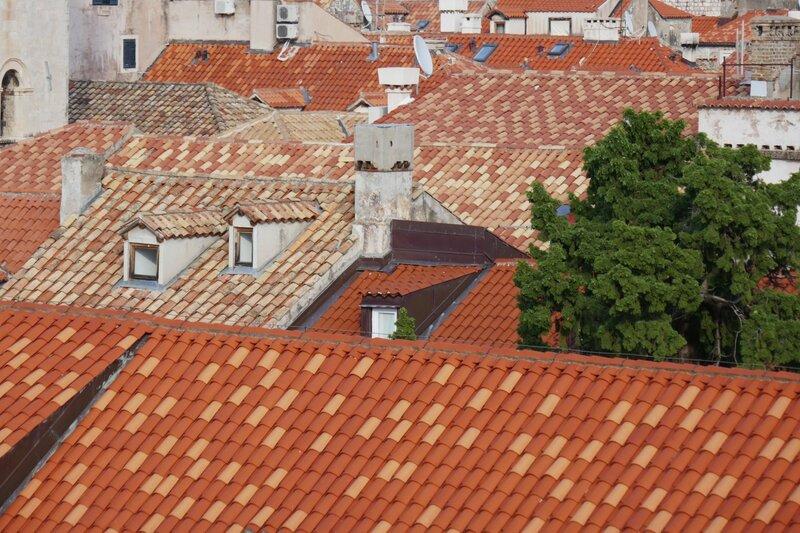 It had been some 11 years since our last visit to Dubrovnik (see the photos here) and I had clearly remembered the difference between the original roof tiles of the old town and the new ones which had been used in the reconstruction after the Serbs had bombed the crap out of the old town in the 1990s Balkan War. But I had remembered the new tiles as being of a uniform colour, and they were clearly not so, now. (above you can see the brightly coloured modern tiles as well as the faded colours of the originals). So I wondered if these new tiles had started to age and change colour unevenly. But no – it was basically a false memory on my part, as a quick check on Flickr told me. It’s clear that a single or mixed colour is a matter of choice. …but there were still wedding celebrations going on. So, tour over, we got on to our bus and headed out to meet up with another van upon which was the group’s luggage. Well, most of it, anyway. Some was missing – ours! Since this included my backpack with virtually all my camera gear in it, I was as worried as Filip was embarrassed. To cut a long story short, they did eventually find our luggage and brought it to the boat quite soon after we got there. 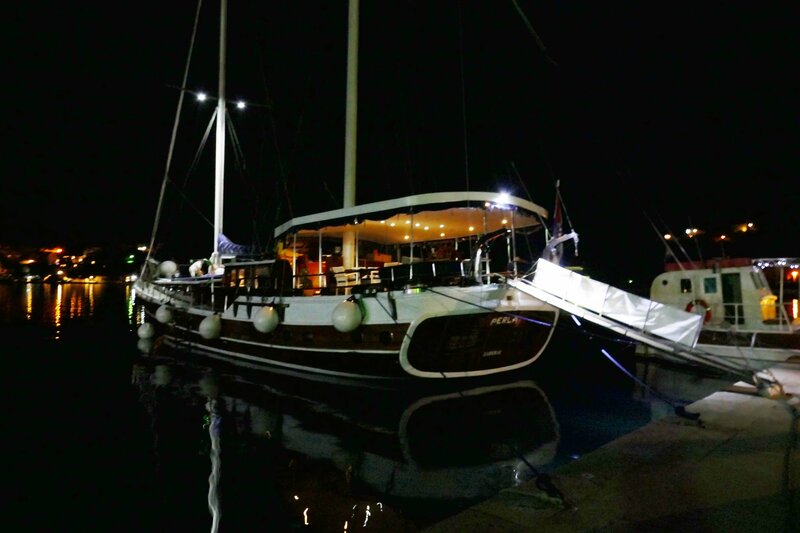 Our boat, a gulet called “Perla”, was awaiting the group at Slano harbour, and looked lovely in the evening dark. We embarked and finally had a chance to get properly introduced to the other nine people in our cruise group over dinner and drinks before turning in for the night. 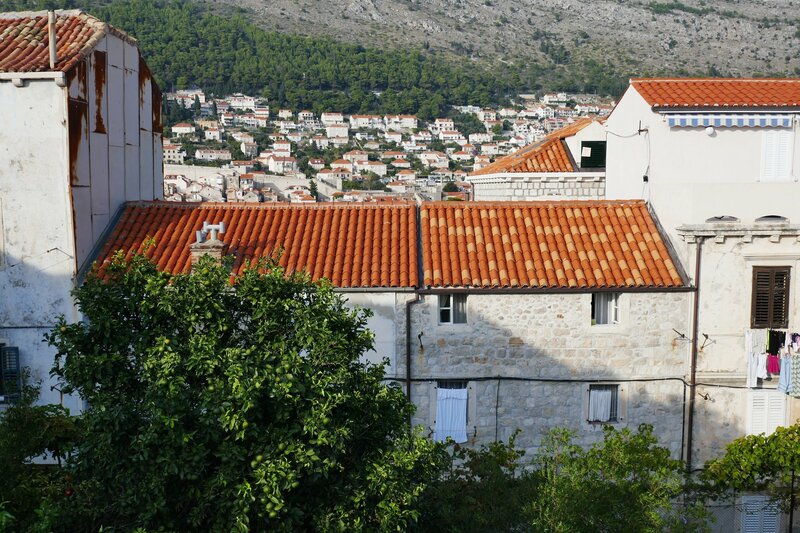 Getting under way early was going to be the order of the morrow in order to get to Korčula and Brač, and that’s what the next gripping instalment will cover. I bet you can’t wait! 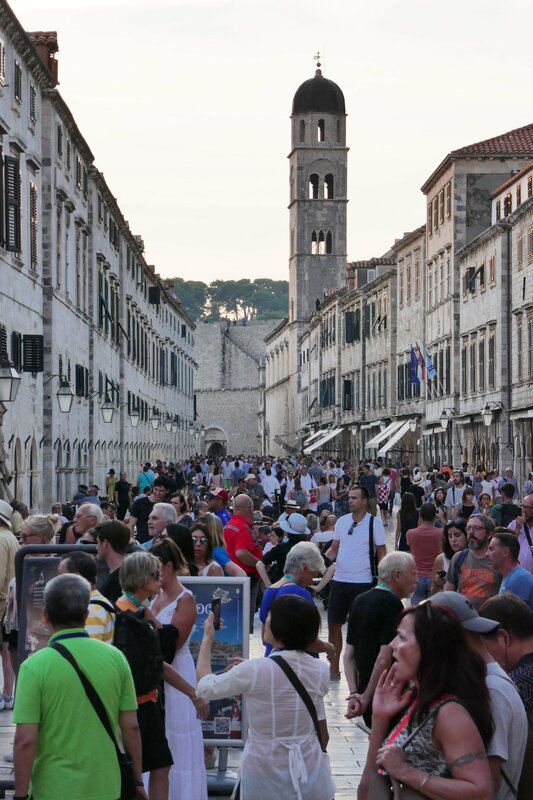 One Response to "Day 8 – Croissant in Croatia, Beef in Bosnia, Dinner in Dubrovnik. Luggage in Limbo"
Wow! Sounds like an exhausting and eventful day – but glad you made it! Looking forward to the next instalment.